Status: This yacht is only on our website for charter. The QUITE ESSENTIAL yacht is a 180.5ft / 55m luxury yacht built and launched by yacht builder Heesen. Delivered to a proud yacht owner in 2011, this luxury yacht sleeps up to 12 guests in 6 staterooms and has accommodations for 12 crew. She has a beam of 30.8ft / 9.4m, a draft of 9.8ft / 3m, and she measures in at 781 gross tons. Her hull is aluminum and her decks are teak. Her max speed is 24 knots and cruising speed is 18 knots. She is propelled by MTU engine. Her interior design is by Ken Freivokh & Michela Reverberi with exterior styling by Omega Yachts/Dobroserdov Design. When it comes to purchasing a luxury yacht, like the yachts themselves, pricing may vary greatly. In the event there is no QUITE ESSENTIAL yacht price , the industry knowledge of Merle Wood & Associates will help you with everything you need to know in order to make the right decisions when buying a luxury yacht. If you’d like to know the availability of the QUITE ESSENTIAL yacht for charter and the weekly rate, view the QUITE ESSENTIAL yacht charter price and summary. For a complete list of amenities available or for a first-hand review of the QUITE ESSENTIAL yacht, simply request assistance from our qualified luxury yacht brokers. Our team of yacht specialists travel the world visiting and experiencing yachts for sale and not for sale. Because of this, they have expert knowledge about every yacht, and can provide further details about the features, amenities and condition of the most notable yachts on the water. We provide accurate specifications, details and current information on yachts for sale around the world. Read the detailed QUITE ESSENTIAL yacht specs and analysis. Read more about the cruising grounds, winter or summer itinerary and the last known QUITE ESSENTIAL yacht location. For more information or to enquire about the QUITE ESSENTIAL luxury yacht, simply contact a qualified yacht broker at Merle Wood & Associates for assistance. 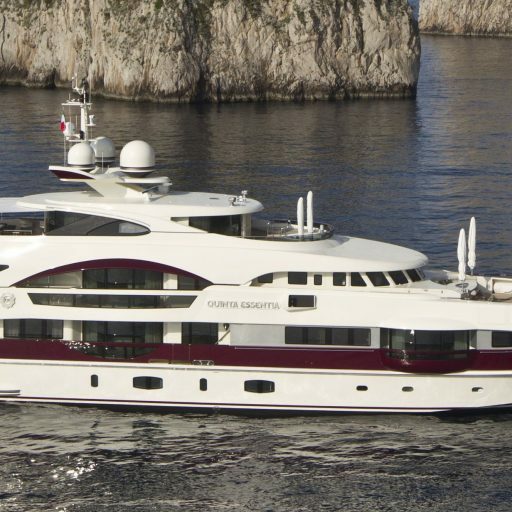 The QUITE ESSENTIAL has been displayed to provide our visitors the most current and accurate data for this luxury yacht. If you would like to report an error or have additional information, including photos and video, related to the QUITE ESSENTIAL, please contact our luxury yacht intelligence team.